Our 2019 Performance Times are coming soon! Their music has been featured on Xbox and Playstation games, NBC’S television show ” the Black Donnelly’s” WWE Wrestling, Don Cherry’s 9,19,20,21,24,27 hockey DVD’s, the Mackenzie Brothers TWO-FOUR special on CBC, HBO’s Shameless, HNIC Coach’s Corner ( the Dale Hunter Tribute),6 music videos on Much Music/MTV, and they’ve reached the top 20 on the edge radio. In 2008 the Campbell brothers were asked to perform on the new CBC ” Hockey Night in Canada” theme song produced by Canadian Icon Bob Rock, where Ron MacLean quoted ” Mudmen we Love Em”. This lead to many opportunities including a 3 month tour,PBS special/DVD and a performance at the Canadian Country music Awards with johnny Reid. The Mudmen have appeared twice on Parliament Hill for Canada Day where they performed and shook hands with the Queen televised, performed at the Edmonton Oilers home opening ceremonies on CBC and performed at the Edmonton Oilers 84 Stanley Cup re-union with Wayne Gretzky, Sarah McLaughlin, Red Ryder & Full 84 Team Present. Stone Clover was literally born above and Irish pub in downtown Detroit. Front man Pauly Brady formed the band in 2009 while living above the pub his grandparents built, the Old Shillelagh. The band started out playing music at pubs and events in the Irish community but quickly expanded to larger venues and music festivals. Stone Clover’s original approach to song writing is a melding of pub style tunes mixes with aspects of rock, punk, gypsy, folk, and Americana. They affectionally call this style of their own “Paddy Slag” as it clearly comes from Irish tradition but also has so many other influences as well. A high energy stage show mixed with anything from fun and fast takes on traditional songs to their own infectious originals is what to expect. The group consists of Pauly Brady (lead vocals, 6 and 12 string guitars), Marc Brockway (bass), Taylor Izak (violin), James McCue (drums) and Connor Payne (back up vocals, mandolin and accordion). 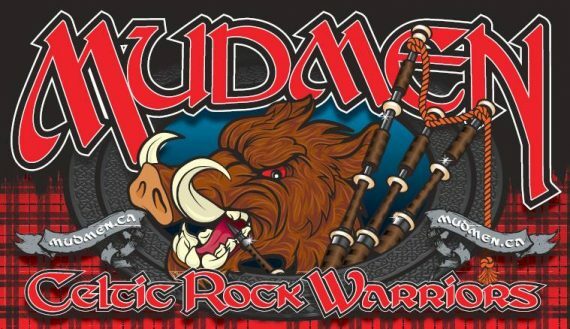 Founded in 2005, this Pipes & Drum band has taken the USA by storm. 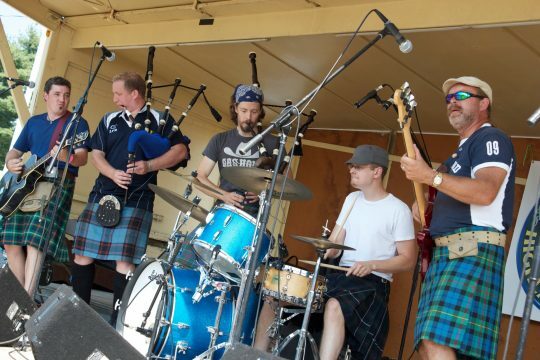 Their unique style, charismatic stage performance, and love for all things Scottish has drawn crowds from coast to coast. A MUST SEE! Not just another Scottish Pipes & Drums band! Albannach’s primal drumming and precise piping stirs the soul of anyone who hears them- young and old! These folks ARE Highlanders! Scottish Warriors to the Core! With 5 CDs, 1 Documentary (Scotumentary), Multiple Fan Tours to Scotland, Canada and the open sea; the Nach Army is 43k and growing! These Celtic Rock Stars are as charismatic off stage as they are on. Being charming, intelligent, funny AND Scottish make all the right ingredients for a great interview. Radio, TV, Print they are comfortable with it all! Albannach is Gaelic for Scottish or Scotsman. This 5 man group consists of: Jamesie-bass drums/vocals , Jacquie-bass drums/vocals, Donnie- champion piper, Colin-lead drums/snare, and DidgeriDrew- didgeridoo. In an effort to take music in new directions, a group of college friends at the University of Vermont started “The Experimental Music Program.” They had some fun, but the group produced lackluster results until one day a bagpiper came into their midst. What strange beastly creation was this? There was no place to plug in an amp. The piper tuned it with… electrical tape? Could this have been what they were searching for? It was.